Reading a Haruki Murakami novel is an immersive experience. Dark holes lead into alternate universes, cats speak Japanese and women disappear into thin air. But you don’t even need to read a word to enter his crazy world, thanks to the surreal, eye-catching Murakami book covers that have come to epitomize his novels. Murakami’s books were originally published in his native Japanese and have been translated into over 50 languages. With the US editions came new book cover designs, courtesy of American designers John Gall and Chip Kidd. Let’s take a look at some of the best Murakami covers, and analyze their themes to inspire your next surreal book cover design. In 1997, Vintage Books designer John Gall created a universal look for all of Murakami’s paperbacks. The result was a dozen covers evoking pop art, Japanese symbolism and romanticized nostalgia, collaged together in bold and unforgettable arrangements. Murakami plays with time in many of his novels. For example, in South of the Border, West of the Sun, the middle-aged lead character is revisited by a boyhood memory, causing his past to meld with the present. In Kafka on the Shore, a teenager runs away from home and crosses paths with an odd, aging man who leads the boy to enter an alternate reality. A Wild Sheep Chase is a hybrid of mythology and mystery that takes its protagonist on a surreal quest through Japanese tradition and modernity. Vintage photographs combined with more modern elements in Gall’s cover designs illustrate the way Murakami fictitiously toys with past and present. Gall actually sourced the faded cover photos of illusive, young Japanese men and women from old Japanese advertisements. All of these images give readers a sense of nostalgia, mystery and romanticism and help them visualize the protagonists of each story, who often have affections for things like jazz and whiskey. The characters in Murakami’s novels love Western pop culture. His worlds are saturated with references to Western music, literature and art. Norwegian Wood gets its title from the Beatles song of the same name, which happens to be one of the character’s favorite songs. The Beatles also play a major role in Sputnik Sweetheart, as does Beat writer Jack Kerouac. And Prince’s “Little Red Corvette” makes an appearance in Kafka on the Shore. Murakami has also admitted that Bob Dylan is his favorite musician, who we see pop up in Hard-boiled Wonderland and the End of the World. Gall collages design elements from Pop art, such as benday dots and brightly-colored shapes with vintage Japanese artwork and photographs to achieve a fascinating blend of Western and Eastern visual styles. We can see the pop music themes of Norwegian Wood tie in the cover design: two purple circles that resemble John Lennon’s circular sunglasses and electric pink lipstick reminiscent of Warhol’s Pop Art screenprint of Marilyn Monroe. Similarly, the pixels in the woman’s face (also seen on the cover of Kafka on the Shore) pay homage to Roy Lichtenstein’s dotted portraiture style. Sputnik Sweetheart uses a Pop art image collage of war and politics to create an image of a Sputnik satellite. And the high contrast, stylized building on the Dance Dance Dance cover evokes ‘60s era Marvel comics and Roy Lichtenstein’s comic book style paintings. In 2015, Gall redesigned this same series of Murakami covers to fit together in an abstract map that documents Murakami’s surreal worlds. Gall’s latest series of covers is characterized by technicolor backgrounds, intricate & clever linework and unique cut-outs. While each book cover design doesn’t relate to the content of the individual book as much as Gall’s original series did, the overarching abstract design is evocative of Murakami’s style and themes. The puzzle-like arrangement transforms the series into a collector’s item, a rare feat for paperback novels. Notice clever details like the small icon of a sheep in Dance Dance Dance that connects to Wild Sheep Chase when placed in the puzzle. Small details like these make this series design gold. Should your book cover design follow the plot of the novel? Or should it pay more attention to the author’s work as a whole? Gall’s book cover designs show us that either approach can work marvelously, if done well. The big difference [when designing paperback] is that you are putting more information into a smaller package to be presented to a wider audience. Should your book cover design be abstract? Or should it be a literal interpretation of the book’s plot? Again, Gall’s two series demonstrate that both options can be successful, as long as you don’t give too much away. If you take the literal route, incorporate abstract elements (like how Gall uses Pop art) to avoid revealing too much of the plot. Whichever route you take, make your paperback book cover design bold and eye-catching, since it doesn’t have the same accompanying attention that hardcovers do. Paperbacks aren’t traditionally considered high value items, but experiment with techniques like cut-outs and clever puzzles to turn your paperback into a collectible. Chip Kidd is the mastermind behind all of Murakami’s hardcover novels in the US. His process for creating Murakami’s covers is very hands-on, which we can see in their sculptural quality. Each is riddled with symbolism, references and artistry—just like Murakami’s novels themselves. 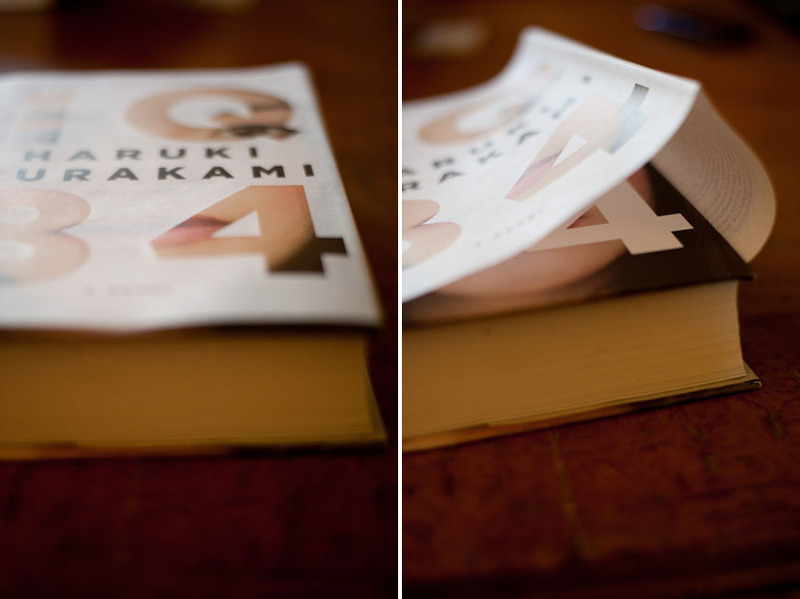 Kidd designed the cover for Murakami’s most popular novel, 1Q84. The plot of the novel follows two stories that weave together in a strange and unexpected way. Kidd translated this into his design by playing with the interaction between the book’s jacket and the cover underneath. A translucent vellum die-cut jacket covers an image of a woman’s face underneath. The mismatched arrangement conveys the idea of going from one plane of existence to another. Kidd’s use of optical illusions fits in perfectly with Murakami’s writing and paves the way for the visual elements of the book’s cover to mimic the book’s interior. Kidd’s version of Kafka on the Shore is the most artistic and involved of all his Murakami covers. He collaborated with photographer Geoff Spear and sculptor Eishi Takaoka for the final piece. The water and shore in the image are actually photo manipulations made from rippled blue glass and sand. He digitally fused these images with a photo of a sculpture by Eishi Takaoka. The back cover features a ceramic cat which was also photographed and fused over the image of the shore in the background. In several of his other covers, Kidd mixes sculptural elements with formal elements such as line and color to create unique, artistic book covers. The Wind Up Bird Chronicle is the most literal of Kidd’s interpretations of Murakami’s work. Although in the book Murakami never describes what the eponymous bird actually looks like, Kidd went with an image of a mechanical toy bird. Kidd admits such a literal interpretation is almost never a good thing, but he saves it in this case by going abstract. The bird on the cover is so big that only part of it can be perceived at one time on the book’s surface, unless you take the jacket off and lay it flat. By abstracting literal elements, Kidd retains his creative authorship and avoid spoiling the story for readers. Hardcovers are more expensive than paperback, and both readers and press expect a lot from these cover designs. I think it’s impossible not to incorporate themes of a book on its jacket. It’s just all about to what degree one does it, and how. Figure out what information from the book needs to be emphasized. Then, create a design that opens readers imaginations and invites them to pick the book off the shelf. Take advantage of every part of the hardcover—the cover, jacket and spine—to create a memorable visual experience and earn your book a permanent place on readers’ shelves. It’s fascinating to see the impact of these famously surreal Murakami book covers on the work of other designers. Take a look at how some of our designers on 99designs are getting inspired by the styles of Gall and Kidd. Book cover concept by nevergohungry. Book cover by Asael Varas. These designers’ clever creations combine surrealism, abstract graphics, collages and cut-outs, which can work for a whole range of books and are a fantastic way to build intrigue. So take a page out of their book and get creative with your next book cover design! Get your own surreal book cover design! Let our designers transport your readers away.